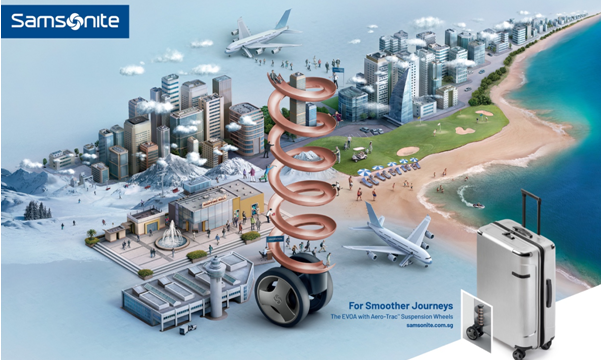 Samsonite Singapore has launched a new campaign in partnership with DDB. In a bid to put a stylish spin on its evolutionary luggage line EVOA, the campaign aims to capture the attention of the City State’s savvy business travellers by highlighting the “product’s unique mix of modern and minimalist design”. The brand campaign will feature outdoor lightboxes to add sparkle along the Marina Bay Financial Centre link way, mobile and online adverts together with YouTube marketing to disrupt the digital space, as well as an eye-catching print ad in The Business Times. “We are very excited to create a campaign that takes on a bold new direction that is visually refreshing yet relevant to the consumer’s travel experience. With Samsonite already a recognised leader globally, it is fitting that they are the ones to push the envelope,” Melvin Kuek, managing director at DDB Group Singapore said. Satish Peerubandi, general manager of Samsonite Singapore, Malaysia, Phillipines and IndoChina said that the EVOA collection allows business travellers to don style without compromising on the functionality of their luggage and bags. “The EVOA is a nod to modern minimalist aesthetics, while featuring Samsonite’s signature durability and innovative Aero-Trac™ suspension wheel technology. It is the absolute epitome of form and function,” he added. Recently, Samsonite launched its first ever concept store dedicated to women in Paragon. Called Samsonite for Her, the store looks to be an omni-channel retail platform, designed to provide a seamless offline-to-online shopping experience for customers. To bolster its customer outreach, the brand will be leveraging on a balanced mix of integrated marketing communications efforts. This is on both paid and earned platforms to drive awareness and interest in Samsonite for Her and what it offers. The marketing of the new concept store will also be led in-house. The Internet and Mobile Marketing Association of the Philippines has confirmed its board of directors for 2014 and is currently bu..
To differentiate itself in the market, MaBelle introduced “Professional Ear Piercing Experience” in 2012, providing a different ki.. The campaign taps local TV star Tsui Wing to urge parents to put down their work and phones and spend some quality time with their.. The airline collaborated with an American mass media company 88rising and its Indonesia R&B artist NIKI to create the campaign's s..